The overall fit of this jacket is very “standard”. We checked some sizes against Joe Rocket’s size chart and found the estimated chest sizes to be accurate. We also tried on a Medium and XL on our Fit Check mannequins Huey and Dewey and they look great (view those shots by taking the View Larger Images link above). Therefore, I recommend you choose the size jacket you normally wear in men’s clothing. You can use the chart to choose if you know your chest size. As compared to many other Joe Rocket styles, I find this jacket to fit a bit more trim, which is a welcome change. Joe Rocket products have mostly had a very generous fit, so a more trim style like this will be welcome. But because of the trim nature of the fit, if you are between sizes, I’d advise you to pick the larger. If you have a bit of a belly you can measure your belly with a tape to make sure the jacket size you choose will be big enough. The max belly size for each jacket is about 6” less than the chest size. 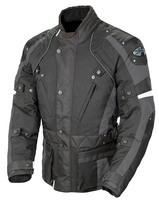 For example, the men’s XL has a 46-48 inch chest and a max belly of about 40 to 42 inches.